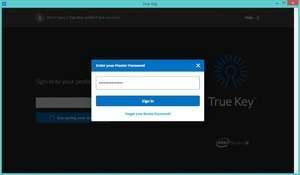 Intel Security True Key is an excellent password utility that works across multiple devices and platforms. It can save important passwords and uses different types of authentication to make sure it's got the right user. Though Intel Security True Key is a freeware application, using the program for more than 15 passwords incurs a fee. For most of us, 15 passwords may just be enough to make this program a modern and useful password manager but in the real world of multiple online accounts, Intel Security True Key may just be lacking. Version 4.15.132.0 is a freeware program which does not have restrictions and it's free so it doesn't cost anything. For security reasons, you should also check out the Intel Security True Key download at LO4D.com which includes virus and malware tests. Additional screenshots of this application download may be available, too.